Whether you need to enhance application performance, improve reliability or reduce costs, adopting Power Systems can help you achieve your open infrastructure goals. With Red Hat Enterprise Linux 7.1, making that move is now simple. Run enterprise applications and enterprise-grade Linux on a hardware platform that’s ready for the modern workplace. 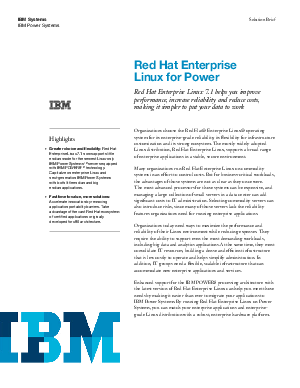 Download this case study to find out more about how Red Hat Enterprise Linux 7.1 helps you improve performance, increase reliability and reduce costs, making it simpler to put your data to work.